Ross: "There can be negotiations with or without tariffs in place. There are plenty of tariffs the EU has on us. It's not that we can't talk just because there's tariffs." PARIS -- The United States and European Union could still negotiate a trade deal even if Washington imposes import tariffs on EU steel and aluminum, U.S. Commerce Secretary Wilbur Ross said Wednesday. EU leaders agreed earlier in May to open discussions about market access for U.S. products, but only if Washington grants the EU a permanent exemption from tariffs. The EU now has a temporary exemption, which expires on Friday. "There can be negotiations with or without tariffs in place. There are plenty of tariffs the EU has on us. 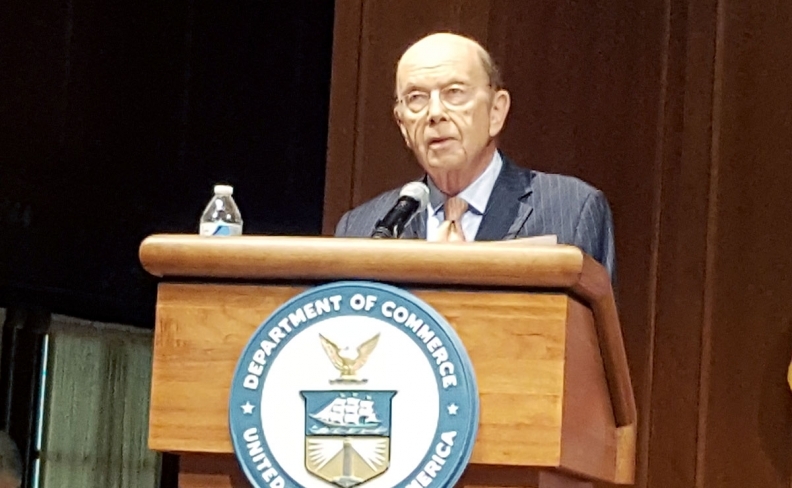 It's not that we can't talk just because there's tariffs," Ross told a panel at the Paris-based Organization for Economic Cooperation and Development. Ross said China was a good case in point, having agreed to negotiate with the U.S. despite U.S. tariffs on certain Chinese exports going into effect in March. "China has not used that as an excuse not to negotiate," he said. "It's only the EU that is insisting we can't negotiate if there are tariffs." He did not say whether the U.S. goes ahead and slaps tariffs on EU metals. European Trade Commissioner Cecilia Malmstrom said on Tuesday she expected some sort of U.S. measure to limit EU exports. A French presidential adviser said "nothing very positive" had come out of recent efforts to stop the U.S. tariffs, adding: "If that's the American decision, the European response will be firm," mentioning counter-measures on selected U.S. products. Ross, who was due to talk to Malmstrom later on Wednesday, said the EU had shown limited interest in serious trade negotiations with the U.S. until a threat of tariffs. The 28-member bloc shelved talks towards an ambitious EU-U.S. trade deal known as TTIP after Donald Trump's presidential election victory in 2016. Dutch Trade Minister Sigrid Kaag, on the same panel, said EU countries agreed that U.S. trade measures designed to protect national security simply should not apply to them and they did not feel they should negotiate, even if China did. Kaag added that a 1962 trade law allowing protection for U.S. producers on national security grounds that Donald Trump has invoked belongs to a different era. Ross also denied claims that U.S. tariffs would harm its own steel-consuming industries. The price of a can of soup would rise just a fraction of a cent and car prices would go up by less than 1 percent, he said. "The sky has not fallen on the United States since we put the tariffs on. It hasn't fallen and it won't," he said, adding that about 20 steel or aluminium facilities had opened or reopened since the tariffs were first announced. Ross also took aim at the World Trade Organization, where Washington has blocked appointments to its appeals chamber, effectively engineering a crisis in the system of settling global disputes. Any dispute mechanism that takes multiple years to settle cases is "no good," he said, labeling a 14-year case over subsidies for aircraft Airbus "a joke." Talk of just tweaking the WTO, as EU countries have suggested, is wrong, he said. "The problem is that people have begun in many multilateral organizations to substitute conversation for action. We don't think just raising issues is adequate," Ross said.